The Designated Pickup Contact and your driver should do an inspection of the vehicle. The Vehicle Condition Report also is known as the Bill of Lading should be filled out and signed by both the driver and pick up contact. Each keeps a copy. Take lots of pictures and/or video with the driver in them if possible. The Designated Delivery Contact and Driver will do a final inspection of your vehicle. If there is no damage both you and the carrier will sign the condition report and each keep a copy. If there is any damage caused by the driver that is covered it should be marked on the condition report and signed by the driver as their fault before they are paid. Take pictures and once they mark it on the paperwork and sign it you must keep this copy for your records and ask the driver where to file the claim. Each carrier has their own procedures for their insurance policy. After you receive your vehicle and complete your paperwork with the carrier notify your agent at Mercury Auto Transport so we can update your file and assist you in any way possible. If for any reason you do not have or get a carrier-signed Bill of Lading or Condition Report after your vehicle has been delivered showing the damage on the report with the carrier’s acknowledgment it is impossible to get your claim filed. It is up to you and/or your pickup and delivery contacts to make sure your carrier is following this procedure. If they are not following this procedure, unless special arrangements are made that specify otherwise, contact your Agent at Mercury Immediately. Q: What if I am meeting the carrier in the evening and it is dark out? Unfortunately, carriers do not guarantee exact time due to a number of transportation for logistical reasons. You can make a request and is possible, however, each carriers answer may be different. Ultimately you will be responsible for having the damage marked on the condition report. Our recommendation; Meet the carrier where it is lit. Most carriers cannot make it all the way to a residence due to their trailer size and type. In this case, it’s best to meet at a nearby lit-up parking lot like a Walmart. If you cannot meet where you feel there is enough light bring a flashlight. This is rare however when if your delivery or pickup location is on a road “less traveled” bringing your own portable light will be your best option. Q: My car was shipped over 2,500 miles which made it dirty. I know this is common in long-distance shipments so the next day I went to get it washed. After I washed it I noticed a scratch. Is this covered even though I did not mark it on the Condition Report? If for any reason you do not have or get a carrier-signed Bill of Lading or Condition Report after your vehicle has been delivered showing the damage on the report with the carrier’s acknowledgment it is impossible to get your claim filed. We recommend to always bring a damp towel or something to wipe your car down with to be safe. Cars are not necessarily always dirty after they are transported but if is, it is good to have a damp towel. You can clean off all the surface area you wish to check. Make sure do to this PRE-Inspection in a well-lit area and keep the bill of lading paper handy, that is your receipt and Condition Report. The carrier should also provide a copy of this document. You will do a POST-inspection, walk around the vehicle. Verify that the vehicle is in the same condition as at was at pickup. Have a towel ready to clean basic dirt in order to verify dirt vs. damage. Have the driver sign on that claim. Without a signature, no claims will be processed. The carrier will/should also provide a copy of this document. Keys: You must provide the selected carrier with keys to the ignition, trunk, gas cap and any locked compartment. Please have copies of your keys made and leave only the copies (keep your original set of keys) after you have checked to ensure that the copies fit all devices/compartments. Don’t Fill Your Gas Tank: Due to DOT weight regulations, we recommend that your gas tank be less than a ¼ tank. Do not Over-pack: Light and soft personal items. Luggage or small boxes may be shipped inside the trunk only (100 lbs max).An infant car seat and spare tire with a jack are integral parts of the vehicle, so they may be included. You will/may be asked for additional compensation if your vehicle is over-packed or require removing anything that is not permanently mounted or bolted to the vehicle.NOTHING obstructing views out of the windows. This is mandatory and is for the safety of our crew. Our crew often must load these vehicles on to the trailer with the mirrors folded in, using only the windows. If their view is obstructed the potential for damage and injury increases greatly. 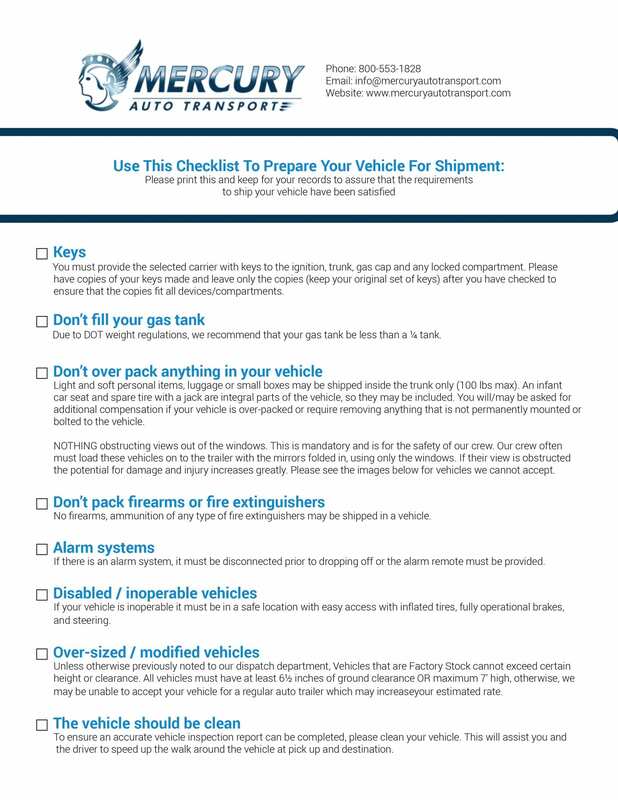 Don’t Pack Firearms or Fire Extinguishers: No firearms, ammunition of any type, or fire extinguishers may be shipped in a vehicle. Alarm Systems: If there is an alarm system, it must be disconnected prior to dropping off or the alarm remote must be provided. Disabled / Inoperable Vehicles: If your vehicle is inoperable it must be in a safe location with easy access with inflated tires, fully operational brakes, and steering. Over-sized / Modified Vehicles: Unless otherwise previously noted to our dispatch department, Vehicles that are Factory Stock cannot exceed certain height or clearance. All vehicles must have at least 6½ inches of ground clearance OR maximum 7′ high, otherwise, we may be unable to accept your vehicle for a regular auto trailer which may increase your estimated rate. The vehicle should be clean: To ensure an accurate vehicle inspection report can be completed, please clean your vehicle. This will assist you and the driver to speed up the walk around the vehicle at pick up and destination. If you have questions please don’t hesitate to contact us!